Three simple words, that unfortunately in today’s world are seldom heard. We are always trying to fix those little problems that we think are wrong with us rather than embracing what the universe has blessed us with. You should love yourself whether you are tall or short, or thick or thin…remember that you are beautiful. To help spread this message and help every woman realize her true beauty, Victoria of Garden of Eden Designs and Lindsay of Scenic Glory have asked their fellow bloggers, designers, crafters, and writers to come together and share why they love themselves. And I am here to join in on their project. We as a community should show that all shapes and sizes are beautiful. It is our spirits that should shine through. I love my hopeless romantic. I was raised in a world of Cinderella stories, happily ever afters, and white picket fences. I’ve seen my parents’ love that has grown and grown through 22 years of marriage. I’ve watched with admiration as my grandparents – high school sweethearts – celebrate over 40 years of marriage. I was raised in a white house with a picket fence and lots of white roses, all of which has made me truly believe that I am Keira Knightley in Pride and Prejudice. And you know what? I love it. And now, I ask you to join in on our project. 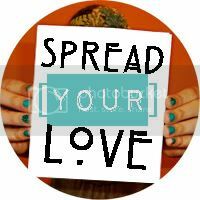 We are declaring the week of June 1st through June 8th Spread [your] Love week, and we want to know why you love yourself. So take a photo of yourself with a sign and let us know why in a post. Help spread [your] love and promote positive body image for all our girls out there. And once your post is up, go link up with Victoria at Garden of Eden here. Your self-love post will remain there for the rest of the year to encourage others to love themselves as well. Participating? Grab the badge below to encourage others to get involved and spread [their] love!